So you're a parent of two kids and you're going out of town for the weekend. You've hired a baby sitter and you start writing the list: dietary restrictions, allergies, insurance information, emergency contacts, medications, any health issues. Before you know it, you have about five pages worth of instructions. ICmed a mobile application that can be used to track health data for individuals and their family members, aims to solve that very problem. 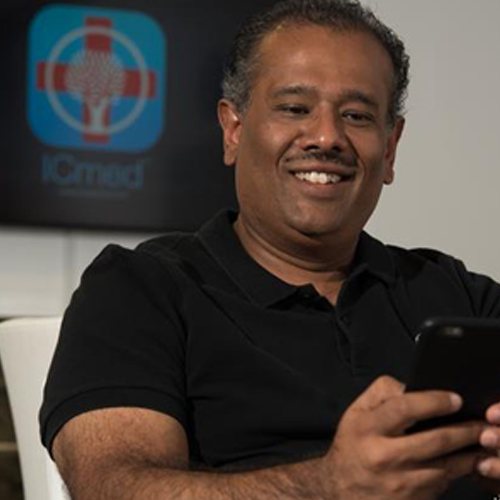 The Baltimore-based company was founded by CEO Anil Kshepakaran who wanted to help his wife and her family better communicate with each other about their health information. ICmed is, essentially, a social, family-based health application and serves a growing population of people who want to "take control of their personal health," said Mike McShea, a chief strategist for ICmed. The company's first generation product garnered over 500,000 users. Now, a second generation app has been released, but the goal remains: to help people "tune in" to what is going on with their own health and that of their family and become active participants in their own health journeys. ICmed is free to download. How did the idea for an app like ICmed come about? AK: I guess it was probably about five years ago. My wife is the youngest of four girls and she and her sisters decided that every year, when they would go see their doctors, they would jot all this information down and put it on a single Word document and share it with each other. They would do this religiously, year after year after year. And then their mother would get involved by adding information about health from aunts, uncles, cousins, and then each of the daughters had their own children and added them, so this document would get larger and larger every year. Finally, she came to me and said 'There's got to be a better way.' She and I started talking about it and I said 'Well, let's make a central place where everyone can deposit this information.' So the company was born based on that idea. MM: It's increasingly important that consumers do take control of their health. Because of the state of the industry right now, your health information is fragmented all over the place, so when you take your son or daughter to the emergency department that doctor that's caring for them does not have some really important information and has no real effective way of getting to it. This puts all of that important information in one place. Is it just a mobile medical record? What other features does it have? There are several other medical apps on the market now What sets this one apart? AK: There's about 160,000 health apps. But there is no medical app that I've found that relates directly to your family medical history. And there's no app that actually provides you information based on the record of you and your family. So this educational content that we're pumping through our system is extremely targeted, which means you're never going to see the content that you would not be interested in. And for the business end of it, it's sponsored. But it cannot be an ad. It has to be evidence-based, educational content and its vetted by an internal advisory board we've set up. A lot of people have concerns about security when it comes to health records. How does your app ensure that people's medical records are secure? MM: And there is also a privacy side to this. Obviously people are not going to use this solution if they are at all concerned or don't trust us with their data. So there are mechanisms that give the ability to control who sees what. You can pick who you want to share your data with and what you want them to see. The next step is our policy, which basically says 'We're not going to share your individual data with anyone and you can opt out of us even sharing your data in a pooled fashion if you choose.' But usually, people don't tend to want to opt out either because they think they are contributing to the greater good, which they are, so research can be done and things of that nature. What is new about the second generation ICmed VIP app? AK: Our second-generation product is now a cloud-based product, so you can access it on the web or you can use your mobile app. You can also connect and share information with different family members across your family. We added a really cool family tree feature that allows people to look at a tree and click on somebody and learn about what's going on in their health ... Our primary thing about this next layer of marketing is related to our enterprise wrapper per that we're putting on our product. That allows organizations to be able to access data streams as well as have content channels for their population. What are your plans for the app going forward? AK: We've got a lot of interesting things we want to do. We've been studying some of these other apps that are out there and it seems like there are three or four things that people want to track. As an example: medications. There are apps that that's all they do, track medications, to look at whether you took them, if there's any changes in them, what medications you're on, refills. Our system does that right now, but we have some unique things that we want to put in to make it so people would want to use our feature within our app, even if that's the only thing that they use in our app because it's going to be so much more intuitive and so much more useful. The other thing is the concept of communicating with health professionals. Maybe with the app, you're like 'This is great, but have more questions.' So we're going to make it easy for people to reach out, from our app and find the right answers with the right people, like a live digital connection.